The results we obtain with our little ones contrast oddly with the fact that mathematics is so often held to be a scourge rather than pleasure in school programs. Most people have developed ‘mental barriers’ against it. Yet all is easy if only its roots can be implanted in the absorbent mind. The Absorbent Mind, p. 186. 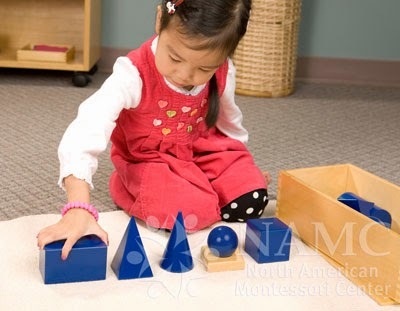 Montessori created the Sensorial materials to provide a “system of materialized abstractions, or of mathematics.” (Montessori, p. 186) Each material clearly and concretely demonstrates abstract mathematical concepts, such as diameter, height, width, length, area, and volume. 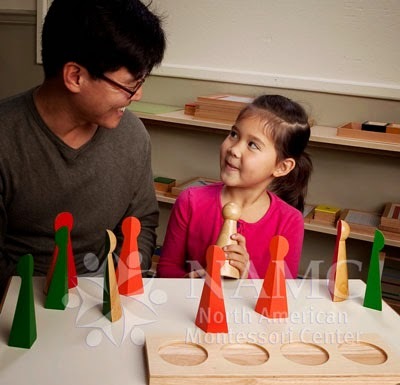 In addition to seeing the ordered gradations and discrepancies in geometric form, the child is able to touch and manipulate each material to sensorially learn why and how each property works. The child’s keen mathematical and ordered mind regulates and controls his world. From the arrangement of household furniture to the order of the toys on the shelf, every object in his surroundings helps him form impressions of his environment. When something is out of place, the child reacts against it until it is made right. Interruptions to a child’s daily routine can cause emotional turmoil because his world is out of order. When adults do not understand the source of these upsets, we often call the child’s behavior “naughty.” In reality, the child is attempting to communicate the frustration he feels while trying to make sense of the world around him. Most adults tolerate disruptions with relative ease. The child, however, is extracting the truth and laws of nature from his environment. It is difficult to learn the rules when the rules seem to change haphazardly. Throughout early childhood, the child is forming his personality. He is learning that he has control over his surroundings. He is figuring out the habits and customs of his family and his environment. Through experience and reflection, the child begins to internalize social rules. And like a scientist, he questions, experiments, and draws conclusions: If I do this, then I can expect that to happen. He learns to discern patterns in his behavior that form the personality he will carry with him into adulthood. © North American Montessori Center - originally posted in its entirety at Montessori Teacher Training on Thursday, July 17, 2014. It can be very confusing for children as they develop and grow. They find themselves in a world full of rules and expectations. The need for the child to act or behave in a certain way, may seem frustrating as the child develop appropriate social interaction in their world.. However, as the child grows they learn and develop personality they carry with them into adulthood.